LONDON, March 21, 2019 /PRNewswire/ -- Despite positive performance of main stock indices and a decrease of volatility in many markets, ongoing geopolitical uncertainties and trade issues continue to dampen investor enthusiasm, resulting in the number of IPOs in the first three months of 2019 (YTD 2019) falling to 199 globally and US$13.1b in proceeds. This is a 41% decrease in deals and a 74% decrease in proceeds from YTD 2018. The technology, health care and industrials sectors were the most prolific producers of IPOs globally in YTD 2019, together accounting for 101 IPOs (51% of global IPO by deal numbers) and raising US$5.4b altogether (42% of global proceeds). By proceeds, technology was the strongest sector with US$2.1b raised (16% of global proceeds). These and other findings were published today in the EY quarterly report, Global IPO trends: Q1 2019. "While Q1 is usually a quiet IPO quarter across regions, in 2019 we've seen IPO markets sent into a cautious wait-and-see mode as a number of factors collide. The dense fog of ongoing geopolitical tensions, trade issues among the US, China and Europe, as well as uncertainty as to how the UK will leave the European Union, slowed down IPO activity in all regions. As we look to Q2 2019, we only need a successful mega IPO or unicorn from the robust IPO pipeline for the fog of uncertainty to clear and global IPO markets to spring into bloom toward the second half of 2019." 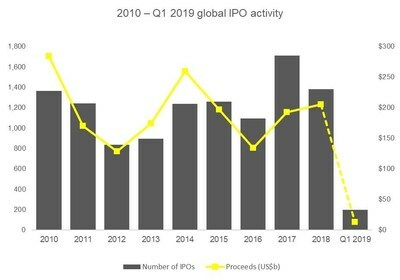 Americas IPO activity fell sharply in YTD 2019, with deal proceeds decreasing 83% to US$3.3b and deal numbers falling by 44% to 31 IPOs, compared with Q1 2018. The US accounted for 65% of Americas' IPOs (20) and 92% by proceeds (US$3.0b). However, in the US, market volatility caused foreign issuers to choose to postpone their listings. Only four cross-border IPOs listed in the US in Q1 2019, in comparison with 15 companies in Q1 2018. The NASDAQ ranked second among the top exchange by proceeds globally in YTD 2019, raising US$2.5b or 19.1% of global proceeds, while Canada's Toronto Main Market and Venture Exchange saw 5 IPOs, which raised US$188m in Q1 2019, and Chile raised $69m via a real estate IPO. "It was a quiet quarter across the Americas, partly because of the US Government shutdown, where the lion's share of Americas IPO activity occurs, and partly as a result of different geopolitical uncertainties affecting other markets. However, as the dust begins to settle following a quarter of uncertainties, we expect IPO activity to return to more normal levels in Q2 2019." A lull in IPO activity also spread across the Asia-Pacific region in Q1 2019 as global economic uncertainty and geopolitical issues prevailed. Ongoing trade tensions between China and the US in particular weighed heavily on market sentiment and the region saw a decline of 24% by deal numbers (126) and 30% by proceeds (US$8.4b) versus Q1 2018. However, Asia-Pacific continued to dominate global IPO activity in Q1 2019, with 63% of global IPOs and 64% by proceeds. This region accounted for eight of the top 10 exchanges globally by deal number and six exchanges by proceeds. The Hong Kong Stock Exchange ranked first by both volume and proceeds respectively, among the top 10 global exchanges. Mainland China saw 30 IPOs raising US$3.7b in Q1 2019. Although these numbers are lower when compared with Q1 2018, they are notably up from Q4 2018, suggesting the Mainland China IPO market may be showing signs of a recovery. Japan continued to demonstrate strength in its IPO markets with Q1 2019 numbers exceeding those from Q1 2018 (23 IPOs in Q1 2019 versus 18 IPOs in Q1 2018). Further, Japan's exchanges (Tokyo, MOTHERS and JASDAQ) ranked number two among the top 10 exchanges by volume. "Ongoing trade issues between the US and China continue to have an effect on IPO market sentiment across Asia-Pacific. But with exchanges across the region recovering from equity market corrections in Q4 2018, there are signs of a recovery in IPO activity ahead. Post-IPO performance levels are another key factor to watch in determining the recovery speed of IPO activity levels in 2019." In EMEIA, deal volumes and proceeds were down substantially from Q1 2018 with EMEIA exchanges posting only 42 IPOs raising a total of US$1.4b in Q1 2019. However, although Q1 2019 was a remarkably slow quarter, those EMEIA IPOs that did come to the main markets experienced average first-day returns of 4% and current returns of around 46%, giving IPO investor sentiment a boost. In Europe and the UK, the ongoing uncertainty around Brexit continued to plague IPO markets, and risk of slow growth in large European economies resulted in only 23 companies issuing IPOs, with proceeds of US$0.4b. EMEIA's two largest IPOs in Q1 2019 came from India's National Stock Exchange, accounting for 94% of India's IPO proceeds and 66% of EMEIA's proceeds for Q1 2019. However, a liquidity crisis among non-bank lenders caused a correction in the Indian stock market in Q4 2018, which has continued to impact Q1 2019 IPO activity. Cross-border IPO activity in Q1 2019 remained at 2018 levels, accounting for 9% of EMEIA companies' IPO activity. "Ongoing geopolitical tensions and trade issues, the risk of slower economic growth and uncertainties about Brexit delayed IPO activity in EMEIA in Q1 2019. IPO candidates are becoming more nervous, proceeding cautiously and taking a wait and see approach. However, with a number of mega IPOs and unicorns in the pipeline, and a diverse group of candidates, including family businesses, carve-outs and high-growth companies, we anticipate IPO activity to spring into action in the second half of 2019." The data presented in the Global IPO trends: Q1 2019 report and press release is from Dealogic and EY. Q1 2019 (i.e., January-March) and 2019 (January-March) is based on priced IPOs as of 15 March 2019 and expected IPOs in March. Data is up to 15 March 2019, 12 p.m. UK time. All data contained in this document is sourced to Dealogic, CB Insights, Crunchbase and EY unless otherwise noted.